Ralph Waldo Emersion once said: “concentration is the secret of strength in politics, in war, in trade and in all management of human affairs”. Being clear about your mission guarantees your strength for persistence in times of trouble and challenges. Focusing your attention on the mission makes you no longer to be a leaf in the wind instead a willow that enjoys the flow of life, always in controls, deeply rooted, bending but not breaking. Do you want to become like the willow? Then, focusing all your attention on your mission is the key. 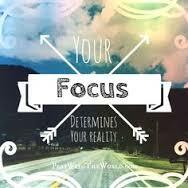 Where should you focus that concentration? On your mission. And when you make a mistake, don’t try to defend it, just refocus your attention on the mission and then move on. You must always keep your eye on what it is you desire to do. John Foster said: ” The measure of success is not whether you have a tough problem to deal with, but whether it’s the same problem you had last year”. A problem solved is a spring board to future success and to bigger and better things. The key is to focus on what you are learning, not on what you are losing. If you do that, then you will open the door to future possibilities. Determines to refocus on your mission. Norman Vincent Peale said: “Positive thinking is how you think about a problem, enthusiasm is how you feel about a problem, and the two together determine what you do about a problem”. For you to move from poverty to success, you need to drop the poverty mentality and possess success mentality, and believe that the opposition and the obstacles cannot stop you. And be ready to reflect and extract all the lessons from your experience, that’s the success mentality. Brain Tracy said: “Your greatest success, your greatest breakthrough, often comes one step beyond where you are ready to quit, throwing in the towel”. Quitting is a failure mentality. He that must become successful must learn to reject quitting. Quitting is a habit that leads to failure and frustration. Your ability to withstand your problems and to refocus on your mission in life and destiny is the key to greatness and true success.